Figure 5. Map of central area at Kfar HaHoresh, 19997. Figure 6. Isometric view oflower area, showing burial pit containing wild aurochs overlain by headless Homo 3, which is covered in turn by lime-plaster floors of Locus 1008and Locus 1009.
mains. There is also a single primary supine human burial with the cranium removed but mandible present — the only 'typical'south Levantine PPNB burial recovered to date at Kfar HaHoresh. Underlying this, and seemingly associated with an earlier plastered surface, is an apparently untreated skull, though its context remains to be ascertained. Scattered human remains are found almost everywhere in the excavated areas. With the exception of one of the few complete arrowheads recovered on-site, directly associated with the first plastered skull, few other obvious grave goods have been noted, save the animal remains. There is some evidence to indicate monitoring, and even intentional marking of, graves on plaster surfaces in the form of small slabs stuckto the plaster surface or the "totem" posthole noted above. Faunal evidence indicates that occupants and visitors obtained meat primarily by hunting gazelle, with cattle, boar and deer also represented among the ungulates. The presence ofgoat in some quantity, however, may indicate that herd animals were in the process ofbeing domesticated (Horwitz 1993). None of the goat remains, however, appear to be associated with obvious grave contexts. No macrobotanical remains have been recovered to date, yet the high frequency of sickle blades seemingly attests to the harvesting of various annuals and/or reeds. While a number of the 'exotics'at Kfar Hahoresh have not been documented from south Levantine PPNB contexts previously, the overall picture in terms of quantity and variety is not particularly remarkable, though all attest to well-developed regional and long-distance procurement and/or exchange networks. They include obsidian and cinnabar from central Anatolia, asphalt (not from the Dead Sea), and malachite, as well as basalt grinding stones, some of the chipped stone tools on nonlocal flint, and marine mollusks from the Mediterranean and Red Seas. 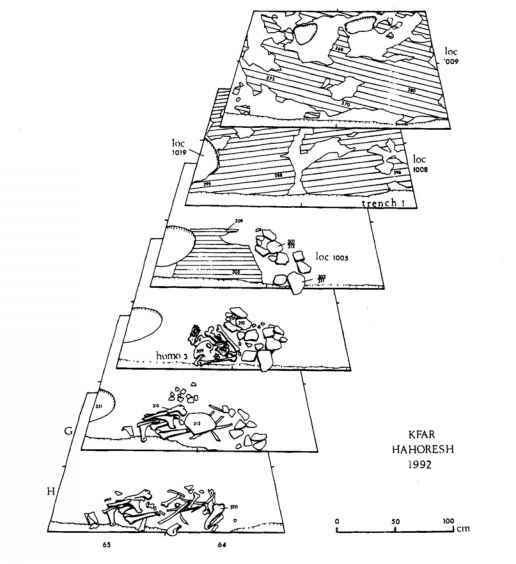 In contrast to Nahal Hemar, the chipped stone industry is not obviously much different from that of "regular" occupation sites: an emphasis on a rough flake technology in the production of ad hoc tools, as well as more refined, specialized technologies for the production of the more standardized tool classes, such as projectile points and sickle blades from naviform cores, and bifacial tools, some, but not all of which, were probably manufactured on site. To the extent that the lithic assemblage differs from published coeval assemblages, it appears to be among the ad hoc element. Intrasite patterning appears quite marked. where arable lands were available in abundance (many other contemporary sites are probably buried beneath subsequent colluvium) (see also Hole, Kuijt, Rollefson and Simmons for further discussions). As such it was probably visited periodically by kin from surrounding settlement(s), though the possibility exists that there may also have been permanent occupation by a few "guardians." The construction of the various funerary structures, with the production of large quantities of lime plaster, involving the bulk preparation of crushed chalk and limestone and the provision of quantities of fuel, stoking of kilns and groundstone and other tools in its application, would have involved considerable effort. So too, the gearing up for (communal?) hunting parties for feasting and provision of animal offerings, as well as various maintenance activities would all require labor, irrespective of the 'costs' involved in the more obviously ritual and ceremonial activities directly associated with the deceased. Even if conducted only periodically, these could all account for the large quantities of seemingly profane remains and refuse on-site. Of course, it is also quite likely that many such "everyday" items may also have been accorded symbolic and ritual significance. In addition to the moving of corpses from the death location for primary burial, further funerary treatment(s) and associated rituals would also have necessitated subsequentvisits. The open areas, with large quantities of roasting pits containing burnt animal bones, likely reflect more than mundane activities: they could perhaps reflect communal feasting associated with some of these funerary rites. Although both plastered skulls are of young male adults, the other human remains (including the cache of mandibles) are of adults and young children of both sexes. This indicates that the entire population, or an entire segment thereof, was afforded similar basic funerary rites involving primary interment, sometimes together with partially articulated animal carcasses. Subsequent human skull removal, as well as the occasional partial articulation of some limb and other bones in clear secondary contexts, appears to indicate that skull removal, sometimes with complete or partial dismemberment of the rest of the skeleton, was done after most of the soft tissues had disintegrated (a year or so later?). Such generalized treatments seem to indicate ascribed status. In contrast, some individuals (young adult males, at least) were singled out for more elaborate treatment of their skulls (facial modeling), which may reflect attained status. Commonly, mandibles and other postcranial elements seem to have been gathered to be buried and intentionally capped by lime-plastered surfaces, some of which featured low surrounding walls. These surfaces, then, seem to be coverings rather than floors, though a couple of the plastered surfaces at the site may actually represent floors. Plastered skulls may also have been similarly treated, perhaps after completing their rein carnated "lifecycle," again sometimes with animal carcasses. It is, of course, interesting to speculate whether the contents of these plastered funerary monuments (at least five have been exposed, though none completely excavated) reflect kin or other social ties, in addition to stratigraphic factors (attempts are being conducted to investigate the matter through DNA studies). Bearing in mind that PPNB burials also occur in occupation sites, it seems that the secluded setting of Kfar HaHoresh, together with the evidence for adults and children of both genders being afforded similar basic, if not full "treatments,'inay indicate that funerary centers were reserved for segments of the population perhaps related by kinship or other ties. Funerary rituals may have been in part exclusionary, involving only some members or segments of the communities involved. The hitherto unique coassociation of human and animal remains, the latter commonly in at least partial articulation but also lacking the skulls (symbolic offerings?) may be particularistic to Kfar HaHoresh. Alternatively, it is possible that this was the common practice in mortuary sites, of which Kfar HaHoresh is the only PPN site documented to date in the southern Levant. Whatever the case, the fact that the animals involved are gazelle and aurochs is probably of symbolic significance in the context of incipient animal domestication, since both are wild (notwithstanding the presence elsewhere on-site of possibly domesticated goat). Gazelle was the staple meat resource in the region throughout the Terminal Pleistocene and the beginning of the Holocene, and its symbolic significance is reflected in animal sculptures in Natufian contexts. The symbolic role of the aurochs is already evident in the PPNB (and perhaps even much earlier), e.g. their prominence among the 'AinGhazal figurines in comparison with their low representation among the faunal remains. 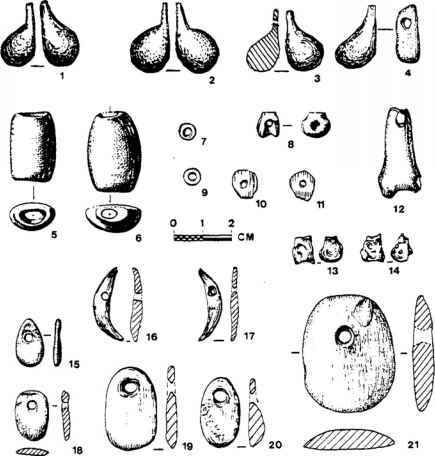 This subsequently develops into the "Bull Cult" of the eastern Mediterranean (see at £atal Huyuk; also Cauvin 1994). Changes in the nature and division of labor associated with the beginnings of herding involving the reduced role of hunting are likely to have had a considerable psychological impact on those segments of the population most affected (the last of the big game hunters? ).